The interior of the island offers magnificent views: the pineapple fields in Opunohu, the breathtaking view from the Belvedere overlooking Cook's Bay and Opunohu's Bay, the white sand beaches all around the island, the view of the island of Tahiti from the sumptuous beach of the resort. An authentic and magical island full of charm. Photo copyright Sofitel Luxury Hotels. Polynesian bungalows float in the lagoon and tucked away in gardens or on sandy beach. Choose from our Villa, Over Water Bungalows Beach Bungalows Garden Bungalows and Lagoon View Bungalows. Each bungalow at this South Pacific resort embodies the beauty of the destination featuring natural materials stone-tiled rainfall showers luxurious deluxe bath amenities modern technology luxurious beds and relaxing day beds. Dine in one of our 2 restaurants, a Beach Bar (right on the beach) or at our Vue bar, poolside. Embark on healing journeys in SoSpa. Float the day away in the fabulous pool or explore the island with a wide variety of activities. Set on a turquoise lagoon, the Sofitel Moorea Ia Ora Beach Resort invites you to discover its mixed heritage. The decorator was inspired by the different Polynesian cultures, subtly blending ultra-modern decoration with traditional architecture. Situated on the most beautiful white sand beach in Moorea, with a total of 113 bungalows and one 2 bedroom Villa Suite, we offer all the modern amenities you expect from a 5 star resort. Enjoy al fresco dining at the contemporary 'Pure' restaurant or luxuriate at the traditionally Polynesian and gourmet 'K' restaurant in a unique outdoor setting. The bar 'Vue' offers a beautiful view over the lagoon and the island of Tahiti. You can enjoy numerous activities: snorkeling, windsurfing, wakeboard, diving, biking, hiking, French bowling, volleyball, badminton. As well, there is a magnificent Spa which offers a large range of treatments, massages, and Jacuzzi. 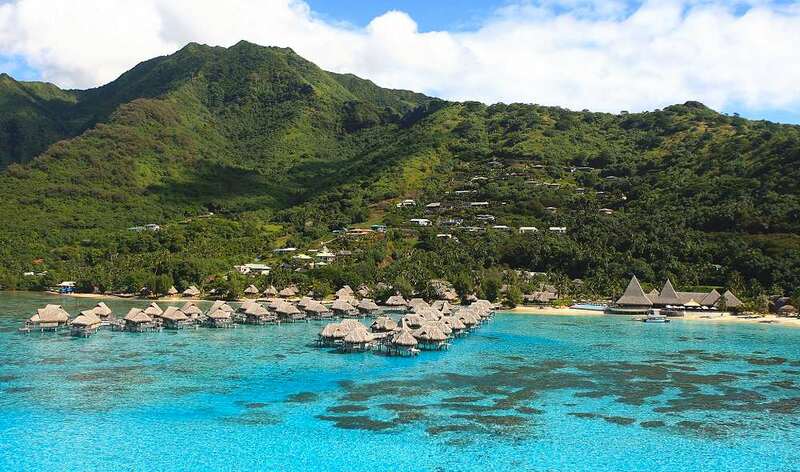 Pros: Probably the most impressive resort on Moorea, with a recent high-dollar total renovation. Beautiful grounds; dramatic pool. Gorgeous bungalows. Has a very high-end feel, like a touch of Paris in Tahiti.